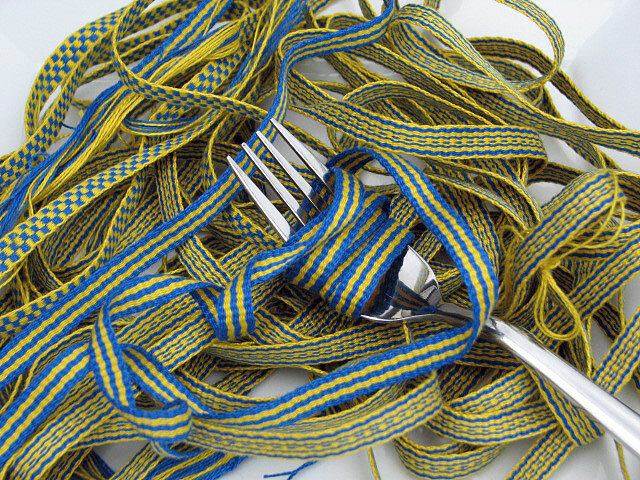 Lately, my diet has consisted of a whole lot of blue and yellow inkle shoelaces. The family scoffed when I tried to serve this for dinner. Hey, in my defense, I figured, cotton is a plant. Plant = veggie = healthy, right? Win, win. Okay, well, no, I didn’t really do that. I did spice things up with a dash of purple and yellow laces I wove for my husband, his brother and nephew to wear to the Tough Mudder Challenge in Pennsylvania this past weekend. Read the purple letters (Team O’B). The yellow just shows the reverse of the weaving. I didn’t finish them in time, fortunately, because they would have been ruined! Yup, it’s so messy people just throw their shoes away at the end. So far I have sold 7 pairs of the 117 pairs of shoelaces I am weaving to raise money to donate to the One Fund Boston. That is 17.5 yards of the same blue and yellow pattern. With 110 pairs, or 275 yards (is my math right?!) to go, I realized I needed to add a bit of variety to the mix. So, I am now offering four patterns for people to choose from. As I designed the four patterns, I again relished in one of the things I love about weaving inkle bands; the seemingly endless possibilities of design. You would think it is limiting to work with such a narrow warp in only two colors. Not true! As I wove, I got to wondering exactly how many patterns are possible with 2 colors and 30 warp ends. and came up with 4 answers. 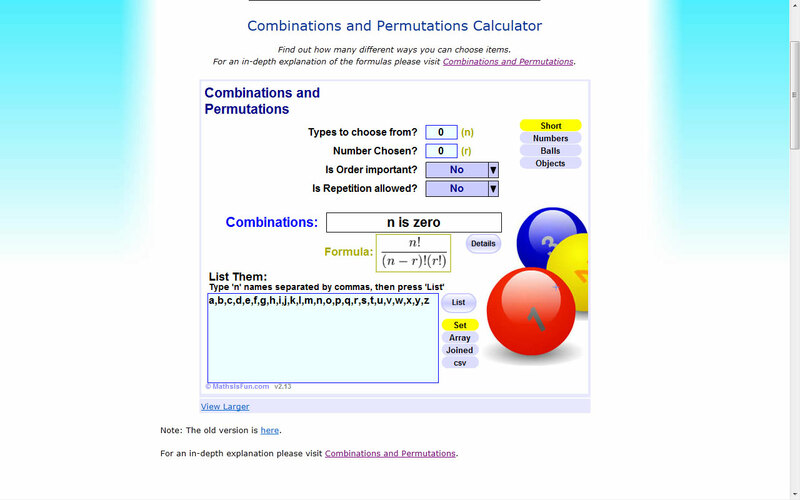 435, 465, 870, 900 pattern possibilities, depending on: 1) if order matters 2) repetition is allowed. Yeah, I don’t know if order matters or not – I think it does… But with two little ones, 5 months old and 3 years old, I don’t see much order, or sleep – and is repetition allowed, yes, he’s three! Oh, wait, sorry, I digress. Now, I’m not sure which is right, but even if the answer is only 435 and I accept that many of the patterns would differ by only one thread changing, that is a lot of possibility to be sure! Are any of you mathematicians? Which is it? Help. Warped minds want to know! Hello Jennifer! This is exactly the kind of thing my husband loves to do. He is a mathematician, so I had him read your post and here is what he says. What it looks like you did is called “30 Choose 2”. That would give you how many placement arrangements are possible of 2 yellow threads in a sea of blue (or 2 blue threads in a sea of yellow). 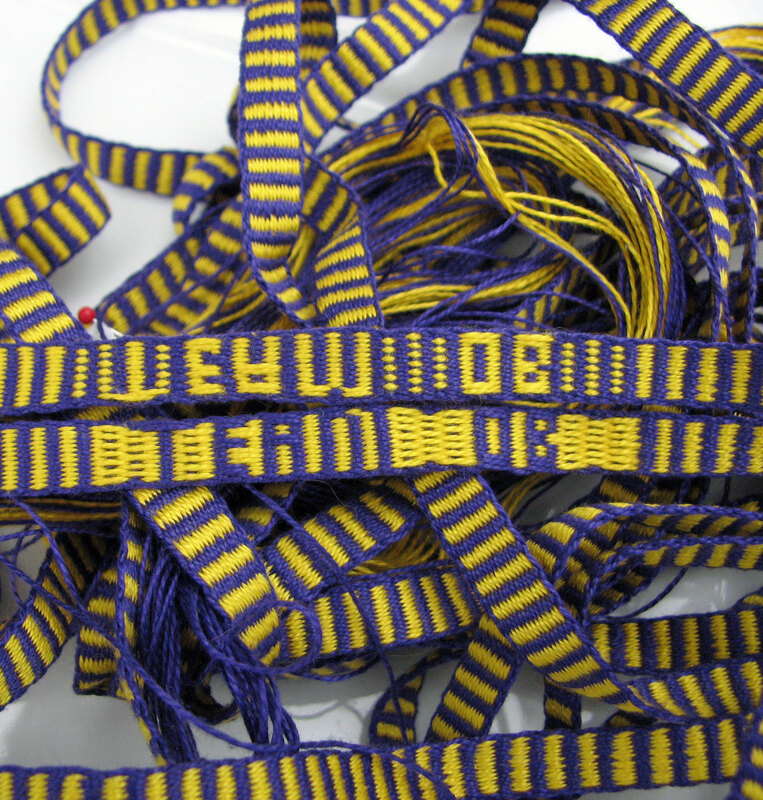 When looking for the total number of design possibilities for each warp end the question is: blue or yellow? With thirty warp ends it equals 2 to the 30th power. Which turns out to be: 1,073,741,824! That’s some power. Too perfect your husband is a mathematician! Is he saying there are over a billion possible band patterns that could made or over a billion ways to arrange the individual threads. Our an I asking the same thing twice? p.s. 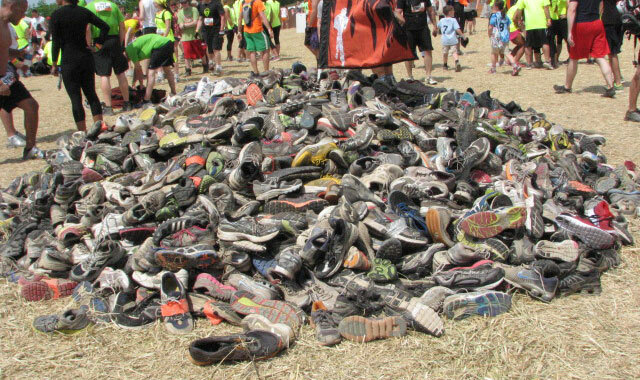 that pile of shoes is a very sad sight to see. Julia, thank you for sharing your opinion about the shoe photo. It never occurred to me that the picture might be received negatively. Do you mind sharing what you find sad about it? You are not asking the same thing twice. It is a good question that illustrates the difference between pure mathematics and actually weaving. My husband’s response is a billion ways to arrange individual threads. So in weaving terms the number is probably half a billion. However, if you alternate thick and thin weft as is done with rep weave, then your design possibilities shoot up again – and might be pretty close to unlimited. (non-mathematically speaking that is) Your checker-board pattern would allow you to do quite a bit of variation on one warp using thick and thin warps. Ok, yes, so you’ve blown my mind. I wasn’t even thinking about warp thread variations. 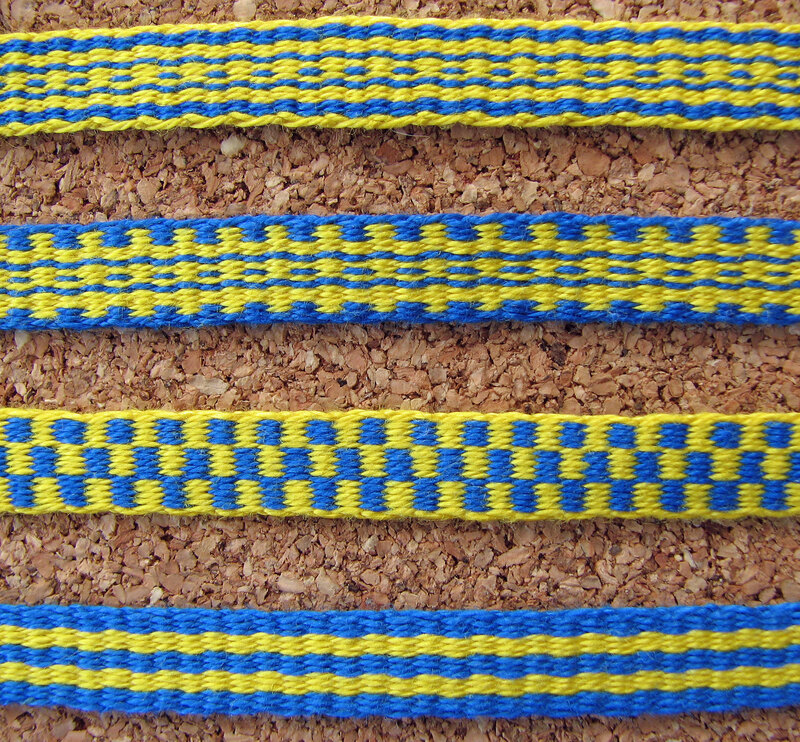 Then you got me to thinking about the possibilities if blue weft is used on yellow selveges or the other way around. Let’s not even talk about pick-up! Phew. The shoe photo is sad to me because I think of all the people in the world who would be thrilled to own a pair of shoes even if they were muddy. It is good that you included the photo. I don’t necessarily consider sadness to be a negative response. The photo is eye opening and reminds me to be very grateful for the life I have. Very insightful. And thought provoking. We are a disposable culture.